For this dish, adding bacon definitely elevates it to another level. Aside from the bacon, I especially like that the brussels sprouts are cut into shreds or ribbons. It almost is like a warm coleslaw only better. 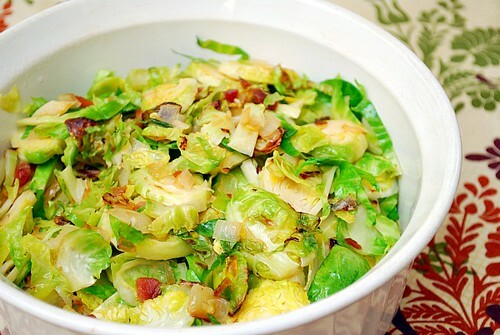 If you have kids (or adults) you'd like to turn onto brussels sprouts, here's one way to do it! In the same skillet, melt butter in with reserved bacon grease over medium heat. Add onions and garlic, cooking until softened. Add Brussels sprouts to the pan and season with seasoning salt and pepper. Cook over medium heat until sprouts are wilted and tender, 10 to 15 minutes. Stir in crumbled bacon and cheese just before serving. I'm going to have to try this. I'm a recent brussel sprouts fan and I love mine roasted. With a little oil, salt and pepper. Ohhhh. Another winner! I use your pan roasted brussels sprouts recipe on holidays, this one will also go in the bag of recipes to try!